A Chance to Dance is scheduled for 10 weeks during the summer (Monday 4:30pm) and then on Saturday mornings from 11:30-12:30 during our season (Sept-June). Class has 2 instructors with one assistant and maintains enrollment of approx. 5-10 students. Dancers learn ballet & tap dance, expressive movement and creative play based on dance (ex: Story telling, followed by how you would move if you were “the princess tip toeing around the castle”, etc….) and even some singing. The 60-minute class is loosely structured with dance as the foundation, but with freedom to individualize, depending on the students needs. Dancers wear comfortable clothes they can move in. Typically, most will wear dance clothes (leotard, tights, and a ballet skirt) but there is no required dress code, we want them to be comfortable and happy coming to dance class. Ballet slippers and tap shoes are requested. Our season runs like a school year, from September through June with a show (recital) on the second Saturday in June at 1pm. The recital is optional, you would decide in December if your dancer wants to participate. If they didn’t want to do the recital, class still continues as usual for them until the week before recital. When you sign up, you pay for your first month, last month and $25 registration fee ($145) total. Monthly tuition is $60. There are no contracts, if you decide the class is not right for your child, just let us know. A Chance to Dance is taught by 2 wonderful teachers, Brenna Bajor and Tia Brown. Both Brenna and Tia that have extensive training and experience with special education, special needs and dance. They have been a part of our dance studio for a very long time and are extremely passionate about working with children. The student assistant, Miss Nicole, is a high school senior who plans on continuing her education working with children. Class takes place in our large dance room with 2 observation windows that parents can see into, but dancers can’t see out of, so that they can stay focused on what they are doing. Before classes begin we talk to parents individually to learn about certain things we should be aware of, if there are sensory differences, certain things that the individual dancer really likes to do, etc…. 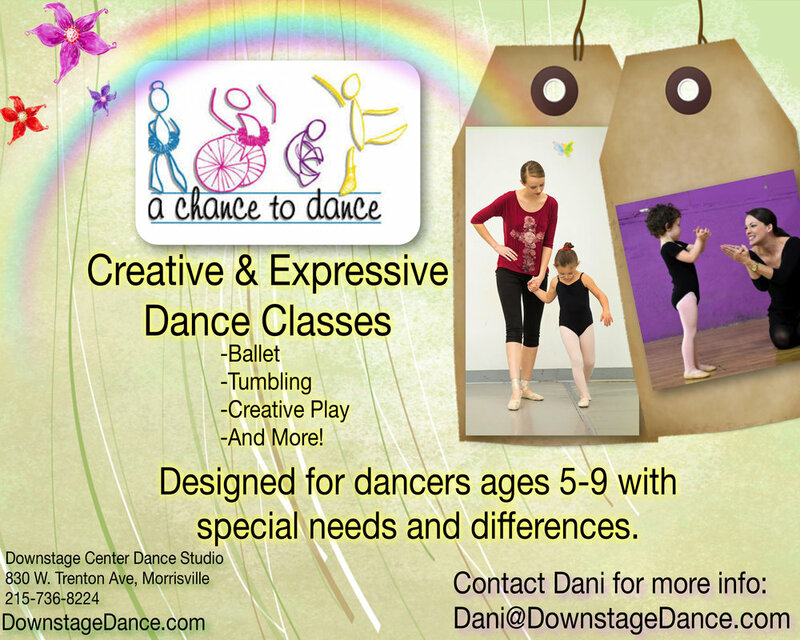 A Chance to Dance is a customized class for dancers to enjoy movement the way that is best for them.